Unlike its predecessors, the new Nintendo Switch has a boring operating system. Not only does it lack Nintendo’s characteristic oddball playfulness, it’s also nearly silent. There’s no music. It’s a shame. The 3DS and the Wii U, Nintendo’s two most recent gaming systems, both had incredible menu music. If you’ve been using a Switch for the past few days, you may have already started to forget just how good those devices sounded. Here’s a refresher. Aaaaah. It’s so relaxing! You can almost hear the pitter-pat of little Mii feet as they crowd into the plaza. It’s so much more musically interesting than your average “welcome to the spa” music like you get on the PS4 and the notably dull PS Vita. The 3DS did something similar with its main menu music, and I actually wrote an entire article dedicated to the handheld’s many melodies. There was separate music for the home screen, the eshop, the system settings menu, the Mii plaza, and even the health and safety information page. Not only is that music just generally nice to listen to, it also makes me feel healthy and safe? It’s on-brand and everything. Yes, that is a still image of the Switch home screen. You can just look at it and not hear music, and you’ll have the same experience as actually using a Switch. In fairness, the Switch does have some nice built-in sound effects, a collection of snaps and chimes that make using the console a little bit more sensorially satisfying than your average Android touchscreen device. But it’s still a big step down. It can’t be easy to compose system music for a video game console. It’s music that millions of people will listen to every day, but if they notice it, the composer’s usually done something wrong. Nintendo has never taken this challenge lightly, and I’m surprised to see them punt with the Switch. 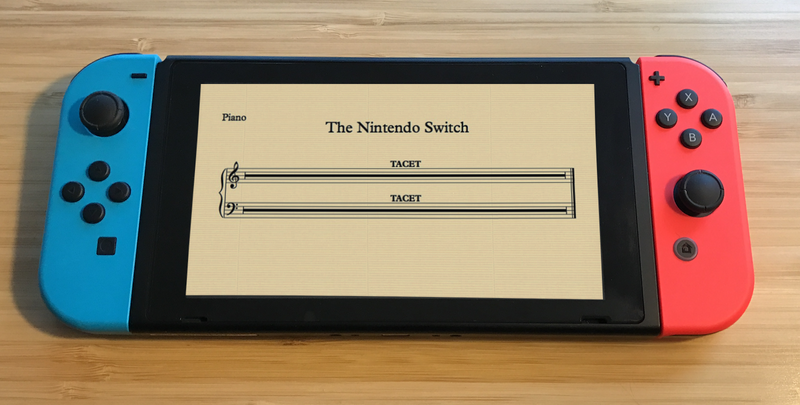 Given Nintendo’s history and musical pedigree, I’m still hopeful that the Switch will get an update that adds a melody or two. And I can understand why they might want to launch with a stripped down, functional operating system before they began adding things. In a year, my Switch might serenade me as I browse my friends list and look for things to buy. Give us the tunes, Nintendo.